The Tasting Table’s Trip to Napa Sweepstakes (TastingTable.com/Napa2017) is open only to legal residents of the forty nine (49) United States and the District of Columbia (void in Rhode Island, Puerto Rico, all U.S. territories and possessions and all overseas military installations) who are at least twenty one (21) years of age or older. The Tasting Table’s Trip to Napa Sweepstakes ends at 11:59 p.m. EST on September 18. 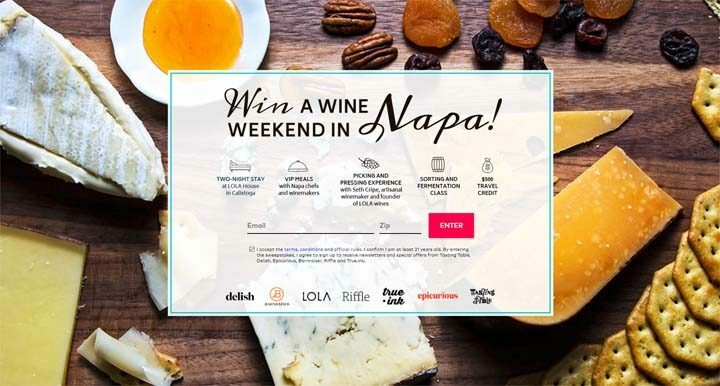 You may enter the sweepstakes by completing all required entry fields provided on the sweepstakes entry form located at tastingtable.com/napa2017. Limit one (1) registration per person and per email address. The Grand Prize Winner will receive a trip for two (2), winner and one (1) guest, to Calistoga, California on October 6, October 8. Grand Prize trip includes: A weekend stay for two (2) at LOLA House, bed and breakfast in Calistoga, California (approx. $500 value). Includes access to the following amenities: One (1) picking and pressing experience for two (2) with Seth Cripe and one (1) sorting and fermentation class for two (2) (approx. $500 value). Meals for two (2) with Napa chefs and winemakers (approx $1000). One (1) complimentary subscription to LOLA wine club (approx. $1000 value). Winner will receive a $500 travel credit.